Alpha Omicron Pi is an all Women's International Fraternity. It was founded in 1887 at Barnard College, New York, New York. Barnard was one of the first schools in the nation to give the same education to men and women. AOPI is a Fraternity for Women, not a sorority. Alpha Omicron Pi Graduation Cords are red and gold double tied cords, meaning one red cord and one gold cord tied together and worn with the knot at the base of the neck. Cardinal is the color of the fraternity because it is	the color of the fraternity flower, the rose. In addition to red honor cords Honors Graduation carries Red Honor Stoles. These Sashes can be custom screen printed or embroidered. At Honors Graduation we pride ourselves in providing high quality honor cords at reasonable prices. Our Red Graduation Cords are no exception. Red and gold double graduation cords can be ordered by selecting red from the first drop down box on the order page, then clicking on the double cord radio button, and finially by selecting gold as the second color from the second drop down box that appears after you have clicked on the double button. 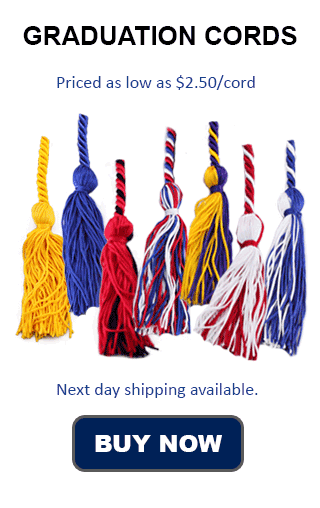 The primary differnces between Alpha Omicron Pi Honor Cords and Red and Gold double cords from Honors Graduation are in the bulk pricing, and the flat rate shippnig. At Honors Graduation we start giving a bulk discount at 5 cords, and you could get double red and white graduation cords for as little as $5 each. Alpha Omicron Pi on Brown's Graduation are $9.95 whether you are ordering 1 or 100. On the other hand, we have flat rate shipping of $4.00 that is guarenteed to get to anywhere in the US in 4-6 days or less. That price is same no matter how many cords you are ordering. Brown's has no such feature. Kindness is a big theme in Alpha Omicron Pi. Their specific red rose, the General Jacqueminot, has no thorns. This represents welcoming to new initiates. Their unofficial mascot is the Panda, which is peace loving and has no natural enemies. These ideals can be signified by the wearing of a red graduation cord or honor stole as a symbol of love and kindness. Alpha Omicron Pi is an international fraternal organization, and has Chapters in 39 states and in Canada. Some of the colleges and universities where they have active chapters are: the University of Toronto, Eastern Washington University, Vanderbilt University, Saint Joseph's University, University of Minnesota, Ball State University, University of South Florida, and the University of Northern Colorado among many others. The Headquarters of Alpha Omicron Pi are located in Brentwood, Tennessee. Their Mission Statement is "Women Enriched through Lifelong Friendship." From the very begining the founders felt that membership should be available to women of any race, ethnicity, background, social, or economic background.